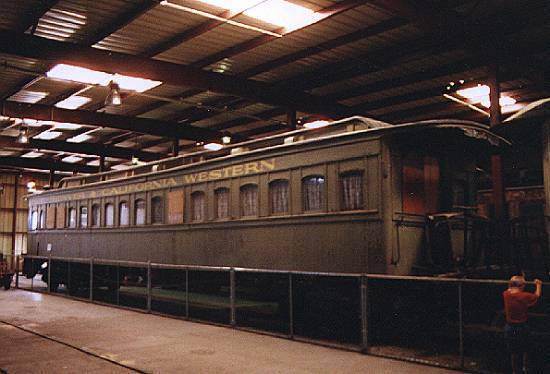 Ex-Central Pacific car lettered for a motion picture now resides at the Nevada State Railroad Museum. The last few weeks have been another hectic time of the year. The Virginia and Truckee Railroad Historical Society had its Annual Conference in Carson City during the first part of October. This is an event I have attended for about 25 years and it is one of the year's highlights for me. Presentations on the V&T's operations and history and made along with a modeling workshop and, usually, a field trip. The nice thing is that these presentations are often presented by professional railroad historians presenting researched facts about nineteenth century railroading in general. The modeling programs featured items on locomotive performance and using 3D modeling techniques. The field trip consisted of a closeup inspection of the V&T coach 17. This was the Directors' Car which conveyed Central Pacific dignitaries to the driving of the golden spike at promontory. Over the years, it saw changes as it went to a coach, then to the V&T and then a career in the movies and, finally, as a museum piece. The V&TRRHS has published a book about the history of this car which can be obtained from the Society website (www.vtrrhs.org). The diesel, having outlived its usefulness, is preserved in the local part. Arriving home from the Conference, I had barely enough time to unpack and do my laundry before getting on another plane to Atlanta to participate in Dixie Rails. 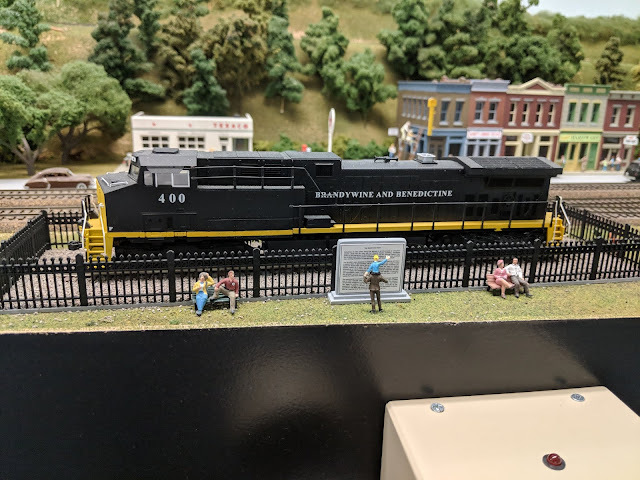 This is a model railroad event put on by the modeling community of the area. It consists of operating on four model railroads over a three-day period. It was great fun on great railroads with my favorite being Norm Stenzel's Brandywine and Benedictine Railroad. It represents a 1953 coal-hauling line in the Allegheny Mountains. There are many large steam locomotives plus some first-generation diesels plus great scenery. Norm has a good sense of humor with several small scenes around the railroad. My favorite was the late-model diesel in the park. If you are interested in early western mining railroading, consider joining the V&TRR Historical Society (www.vtrrhs.org). There is a quarterly magazine and a great conference.